Great crested newt adults are easily distinguished from the two other native newt species, the smooth and palmate newts, found in Britain today. The great crested newt is the UK’s largest newt, reaching a maximum adult overall length of about 170mm, although size varies between populations. Mature female length ranges from 90-170mm, typically reaching 110-130mm. Their male counterparts typically mature to a maximum length of about 150mm, though most are 110-120mm. 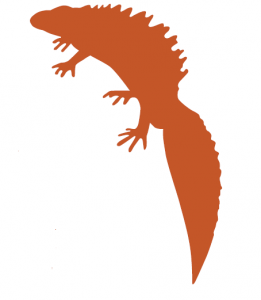 What makes the great crested newt different? The skin of adult crested newts is granular in appearance with a black or dark brown background colour with darker spots which in males extends onto the crest. It has very fine white spots on the lower flanks. As so often in nature it is the male great crested newt that is the colourful breed, doing its best to entice the female into courtship. Males have a very impressive jagged crest along their back that dips at the rear of the abdomen, and a smoother edged crest above and below the tail. Their crest decreases in size as the breeding season comes to an end – so often cruel sign from nature that time is running out to mate. Males also have a white, silver or grey stripe running from the tail tip along the central, fleshy section of the tail that fades as it approaches the abdomen. On land, the great crested newt appears virtually black, and in males the crest shrinks back against the body. The female lacks a crest and white tail stripe, but has a token yellow-orange stripe running along the bottom edge of the tail. Both sexes have a vivid orange or yellow belly with an irregular pattern of dark black spots or blotches. Male palmate newts have a protruding filament at the tail tip, with a low ridge along the back rather than a crest and the female smooth and palmate are very similar in colour and pattern, usually with a beige or brown background colour, with lighter undersides. The larvae of great crested newts can be distinguished from the other species by the presence of a filament at the tailtip and black blotches over the body, tail and crest. They can be very hard to tell apart when they are under 20mm in length. 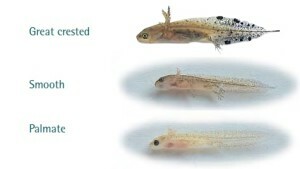 Great crested newt larvae are considerably larger, reaching a length of 50 – 90mm before metamorphosis (compared to 30 – 40mm for the smaller species). Continental forms of crested newt are very difficult to tell apart from native British great crested newt without expert help and analysis. The release of exotic newts in the wild is unlawful and undesirable as they can have a negative effect on native species. After around 16 weeks, metamorphosis is completed when the gills and tail fins are totally resorbed, and the juvenile newt emerges from the pond onto land. As a quick and accurate alternative to traditional methods of surveying, during the breeding season Fera offer environmental DNA (eDNA) testing for the presence of great crested newts in pond water. The analysis uses a single sampling visit per pond to confirm the presence/absence of great crested newts. Fast confirmation of absence by eDNA testing can save the cost and time of further surveying and allow for faster progress of planning applications. Order here now!